The 14th Edition of Cartridges of the World is a handy reference that contains illustrations and basic load data for over 1500 cartridges. If you load for a wide variety of cartridges, or are a cartridge collector, this book is a “must-have” resource. The latest edition (released in December 2014) includes 50 new cartridges. This important reference guide can be ordered through Amazon.com for $28.42 (or just $20.99 for a Kindle eBook version). 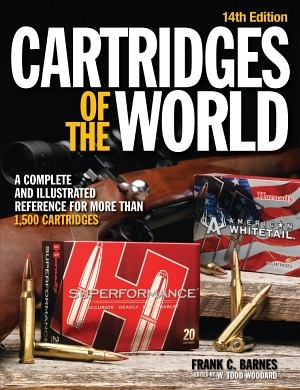 Cartridges of the World, the most widely-read cartridge reference book, has been totally updated, with a newly expanded, full-color 64-page color section featuring essays from some of today’s most prominent gun writers. The 14th Edition of Cartridges of the World (ISBN: 9781440242656) includes updated cartridge specs, plus essays by leading writers on the topics of SAAMI guidelines, wildcatting, and new cartridge design trends. Cartridges of the World is the most authoritative cartridge reference guide in print. Cartridges of the World by author Frank C. Barnes was first published in 1965. The 14th Edition is edited by W. Todd Woodard, Editor of Gun Tests magazine and author of several firearms reference books. Frank Barnes (1918-1992) began collecting information on handgun cartridges at the early age of 12, thanks to his father, a police officer. Frank Barnes was an innovative cartridge designer, who invented the original 308 x 1.5″ Barnes, predecessor of the 30BR case. Before Frank began a law enforcement career, he was a college professor. Frank was also a pilot, and a race-car driver. Learn more about Cartridges of the World (14th Ed.) at www.gundigest.com. Share the post "1500+ Cartridge Types in Cartridges of the World"
The 12th and 13th editions have made this my favorite reference book. It really helps us nuts find the next “must have” depending on the rifle, handgun, or cartridge you are interested in. I will order the 14th today!